I was alerted to this book by Scott Parker at Do Some Damage. And if you know how much I love skulls (and skeletons) on book covers, you will understand what drew my attention. The illustration by Leo and Diane Dillon on the dust jacket is just gorgeous. I was familiar with the Dillons as illustrators of children's books, but I was amazed to see how many adult books had cover illustrations by the couple. The interior illustrations are by Joseph Mugnaini, who was also responsible for the cover illustration of the first edition of this book. The book has an unusual history. Bradbury wrote a script for MGM at the request of Chuck Jones, for a planned animated film. The film was not produced so Bradbury wrote a novelization of the script and published it in 1972. Then, in the early 1990's, an animated film based on the book was released by Hanna-Barbera. And up until ten days ago, I had never heard of the book or the film. Eight boys go out trick-or-treating on Halloween, but their friend Pipkin is not feeling well enough to join them. He promises to meet them at a haunted house where they instead encounter an odd man, Carapace Clavicle Moundshroud. And a huge tree filled with pumpkins. The story is a combination of two quests: a journey through several countries to see different versions of the Halloween story and to find Pipkin, who keeps eluding them. I especially like that the last country visited is Mexico and El Dia de Los Muertos. Before that they visit mummies in Egypt, Rome, Greece, medieval Britain, and gargoyles at Notre Dame in Paris. I am sure that I am not the first person to wish that this book had included some girls. But that is a minor complaint; I suppose it was a product of its times? Although, in 1972 I was just out of college and planning to have a career, and even then I would have wanted some girls in the book. The adaptation decreased the number of children to three boys and a girl. But I have never seen the film. The writing in this book is often like poetry and the story would make a great read-aloud for adults and children. This is not a perfect book, but it is a lovely way to celebrate Halloween. Never heard of this book..but I did find it as an e-book here in Then Netherlands. Just 2,45 euro's and I have my Halloween read for today, Halloween! Thanks Tracy...and Scott Parker for sharing this 'spooky' suggestion! PS: the book is even translated into German! I am glad you decided to try this book, Nancy, a story by Ray Bradbury is always worth a try. Bradbury did have a fabulous writing style, didn't he, Tracy? I always did appreciate that about him. "A Sound of Thunder" by him, a time travel story. That is a great cover and just right for Halloween. Ray Bradbury has always been a favorite writer of mine. Thanks for letting me know about a new/old book to look for. I was very surprised to hear about this story too, Fiona. I love the cover and there are other editions with lovely covers also. I'm not sure about the book but I do like the cover design. Katrina, I always hesitate to recommend fantasy or children's stories, and this is both. People differ greatly in what they like in those genres. But the cover is great. Tracy, I enjoy reading Ray Bradbury because I like his narrative style and besides sf is one of my preferred genres. I'm always on the lookout for his old paperbacks mainly for their covers. 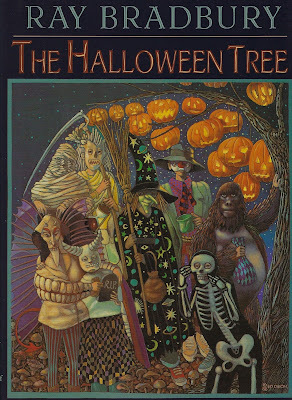 I have collected a few, including "The Halloween Tree" but with a different cover. The artwork on this one is amazing. And yes, I still have to read this novel. I have a lot of books that I have collected and still not read, Prashant. I look forward to reading more by Bradbury. I have enjoyed some Ray Bradbury books in the past, but not for a year or two. Probably going to stick with what I already have. Glad you enjoyed it though. I haven't read much by Bradbury recently, Col, and I would like to try more of his books. I will probably end up rereading some of his books that I read in my twenties. New on to me, and that's saying something for Bradbury. I try to reread DANDELION WINE every year or two, but it's been nearly 5, by my reckoning, so it's time! I have a copy of DANDELION WINE that I got in the last couple of years, Rick. I don't think I have every read it, and I should do that.